*sob*sob* I nearly kena tinggal. As we were going out yesterday, I was naughty. I hit Papa and then I hit Mamarazzi. Both were angry with me and scolded me. Said that I was to stay home. Cannot go gai-gai. 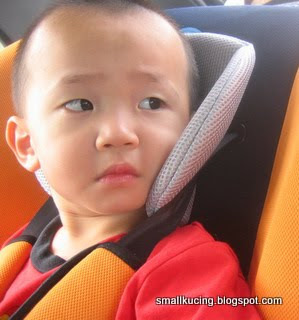 I cried and cried and when they ask me whether I'll be naughty some more or not, I geleng kepala. Only then did they let me go with them. We finally arrived at the RSH Warehouse Sale at Lot 691 Kompleks Hamodal 5, Jalan Lagoon Selatan, Off JlnKewajipan, SubangJaya. It's only 10.30a.m. but many people in the warehouse already. Very crowded. 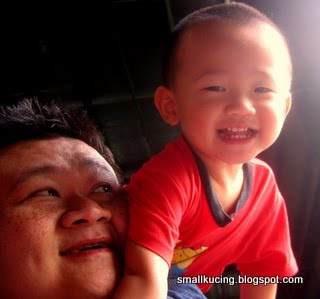 I get to ride on Papa's shoulder. Very cheap. Saw there are some swimming goggles, a lot of sports shoes going at half price around RM139-RM199(NP: RM250-RM400), ladies and men sandals, kids sandals, badminton racket, swim suit and a lot of T-shirts RM19-RM39(NP RM70 and above). Four counters were open for payment at the queue started to be long at 11.30a.m. Very crowded and very hot. From my birds eye view, I saw a Kor Kor and Jie Jie seems to be cold coz they were hugging each other tightly. The Kor Kor hand must be freezing coz he put in the Jie Jie pant back pocket and kept on rubbing and rubbing. Hmmm...or maybe he was just helping the JieJie to look for her money kot? So...back to the story. What did we buy? Mamarazzi managed to grab this pair of sandals at RM5. 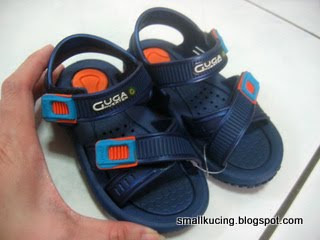 And this pair of Rider Sandal for me at RM10. Still a bit big but my feet are growing very fast. 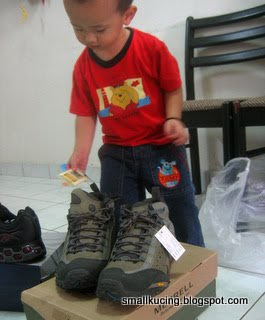 And this pair of Merrell. Wow! only RM150. 60% off the original price. 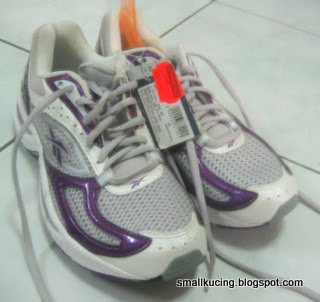 Mamarazzi's pair of Reebok at RM139. 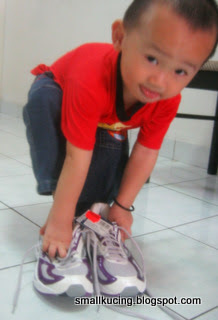 I wanna try too coz I heard Reebok shoes are very comfy. Cantik tak? wahhh...u bought so many!! keng ah!! wow...how i wish im there too. Love to get a new pair of sneakers! Ha, Joshua! Noti-ah! Cannot simply hit Papa and Mamarazzi one ah, must respect your elders. test test see if i can comment or not now. EH my husband also went to this wearhouse sale never bring me!!!! aiyoh.. so chap SHU LA! 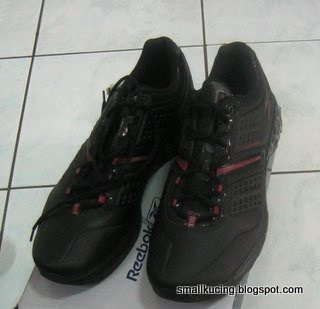 I also tak biasa buy Reebok but since it's a warehouse sale and cheap, so bought lor. Yikes! jogging also wear boots ah? How to jog...? They have ladies sandals there too. I think something like rm19/ pair. Not too sure coz i didnt look properly. ya lor..the size always tarak ngum. One brand UK size is different from another brand UK size. Maybe the "cutting". Gosh...saw a lady borong so much. Total amount RM1,322!! Baju and shoe. Maybe to sell kot? I am very poor. 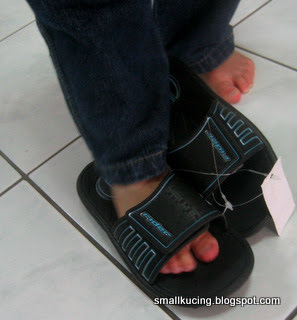 Pakai selipar jepun sudahlah! Ehehehehehehehe! Wah... all above rm100 oso you consider cheap hor? To me, they are still expensive leh. Me very the stingy wan... patut ler my anak tegur haha! Wah....buy alot wor...fun to shop in warehouse sales hor...hehe! Haha...Joshua's bird eye view saw something *cough cough*. funny. And that's a lot of shoes!!! All going jogging?